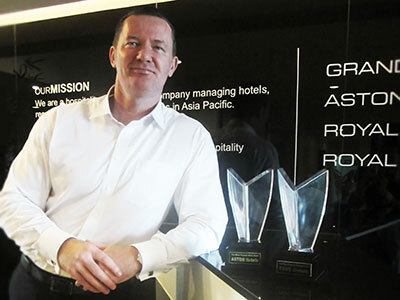 Jakarta, December 10 2015 - Archipelago International Continuing its reign as Indonesia's multi award-winning hotel management group, Archipelago International recently received the highest accolades at the Indonesia MICE Awards 2015, taking home two of the biggest awards. Aston Hotels were named “The Most Popular MICE Hotel” and favehotels was awarded “The Most Popular Budget Hotel 2015” in Indonesia. The prestigious Indonesia MICE Awards 2015 was organized by VENUE magazine in cooperation with the Ministry of Tourism, held on December 2, 2015 at the Indonesia Convention Exhibition (ICE) in Serpong, South Tangerang. As in previous years, the Indonesia MICE Award is held to recognize the MICE (Meetings, Incentive, Convention, Exhibition) industry's biggest players who are considered to have contributed to Indonesia's MICE and tourism industry. The event aimed to share knowledge about MICE in Indonesia as well as to give appreciation to people and/or companies who were involved in the growth of the country's MICE sector. The MICE industry has become a prime focus of tourism development in Indonesia and one of the seven categories of special interest initiated by the Ministry of Tourism and Creative Economy. That is, MICE has proven to provide great opportunities for attracting large numbers of tourists through various events organized by both national and international organizations, and as such, the MICE awards took the time to present a discussion about the conditions, opportunities, and challenges faced by the MICE industry in the years to come to take strategic steps to ensure the next business year remains smooth. Repeating its feat in 2014 for The Most Popular Budget Hotel in Indonesia, this year's award marked the second consecutive win for favehotels. Since launching in 2009, the favehotel offers good rates on its spacious and stylish rooms, without sacrificing on the quality of its facilities. High-end amenities include top of the line beds and cotton linens, LED TVs and free high speed Wi-Fi throughout the entire hotel. And, with a team of professionally trained staff on hand, each stay is topped off with the signature attentive favehotel service. The popular hotel brand currently operates more than 35 hotels throughout Indonesia and Malaysia including 12 in Jakarta and 5 in Bali, with an upcoming development pipeline of more than 40 hotels set to open at major cities across Indonesia, Malaysia and the Philippines. As Archipelago International's first ever hotel brand, Aston covers both hotels & serviced apartments that exude a sense of warmth, friendliness and comfort while delivering delightful moments of heartfelt service and facilities to suit a wide range of travelers. Launched over 18 years ago in Bali, the brand was brought to Indonesia in 1997 by Charles Brookfield, Founder and Chairman of Archipelago International. Now, in 2015, the ASTON portfolio stretches throughout Indonesia spanning 42 hotels together with an extensive development pipeline for further future expansion. John Flood, President and CEO of Archipelago International proudly received the two awards from Mr. Tazbir, the Assistant Deputy of Business Market Segment and Government Development, and representative from the Ministry of Tourism Indonesia. “We are extremely proud to be one of the biggest winners at this year's prestigious Indonesia MICE Awards. Not only did two of our most popular brands receive two of the highest standing awards, including our first ever brand, Aston, but we are also delighted to be recognized as a huge contributor to Indonesia's developing MICE sector and the ever-growing tourist market. That is no doubt an honor in itself.” said John Flood, President and CEO of Archipelago International.